Adaptation to Climate Change in Developing Countries. Doktorarbeit von Chika Ubaldus Ogbonna, Verlag Dr. Kovač 2018, 320 S.
Climate variability and change has become a major environmental challenge facing developing countries in the 21st century. The natural resource-rich Niger Delta of Nigeria is highly vulnerable to climate change and variability. The research elicited data from multiple stakeholders within relevant agencies and organizations, with a focus on the stakeholders’ views on legal and institutional challenges to adaptation in Bayelsa, Delta, Imo and Rivers States. Assessment of legal documents and legal cases were imperative in building arguments that could be helpful in understanding the legal intricacies that may be considered in carrying out adaptation in the selected states. The study revealed that temperature trends in different states of the region that make up the study area were consistent with Nigeria’s climate model, despite the increasing flood incidence during rainy seasons. 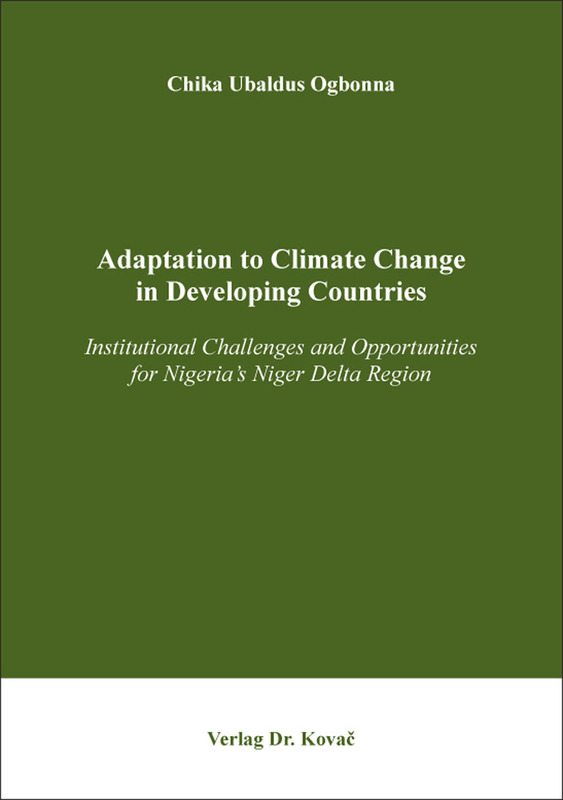 The study also revealed key challenges to adaptation ranging from inadequate institutional mandate to carry out adaptation, weak inter-agency coordination and collaborative efforts to lack of political willingness and planning and regulatory issues.